This is the title of a blog post by Jake Vanderplas, researcher in Astronomy & Machine Learning at University of Washington. He points out that conducting successful research requires more and more data manipulation skills, going along programming skills. However, in academia, ability to write good software is not promoted, if not discouraged ! "academia has been singularly successful at discouraging these very practices that would contribute to its success"
"any time spent building and documenting software tools is time spent not writing research papers, which are the primary currency of the academic reward structure"
On the other hand, software skills are very important and thus well rewarded in the industry, thus the idea of "Big Data Brain Drain" which pumps talented young graduates out of academic research. Jake's post is the "medical diagnosis", and each disease calls for a treatment ! Since the problem is sociological/organizational, the treatment must be sociological/organizational. Jake lays 4 propositions, in particular the evolution of research evaluation criteria. Of course the "implementation details" of evaluation are always a tough issue, not only for research (thinking of learning and teaching evaluation here). "Making an openly available program for electrical machine sizing would be immensely useful for our research community! It would summarize 20 years of research of our group. I just don't take/find the time for it." This is an (approximate & very shortened) transcript of the reaction of Hamid Ben Ahmed, one of my PhD advisor when discussing the topic this week. This means that in the field Electrical Engineering (which is has been tied for decades with closed source softwares like Simulink or 3D finite elements models) the feeling that "something is not working" is already there, and that's a good start! Just recently going through Fernando Perez' G+, I went across several links on open science and reproducibility of science. One blog post about the non-evolution of Elsevier publishing policies. As a result, Greg Martin, a mathematician in Vancouver, has decided to resign from the editorial board of Elsevier’s Journal of Number Theory. Matthew Brett blog reminded of a pretty bad example of error in computing that I encounter when working on my last conference paper dealing with the modeling of a sodium-sulfur battery (cf. PowerTech article on my publications page). and now the interesting thing is to compare the October 2012 version to the February 2013 version (submission of the full paper). 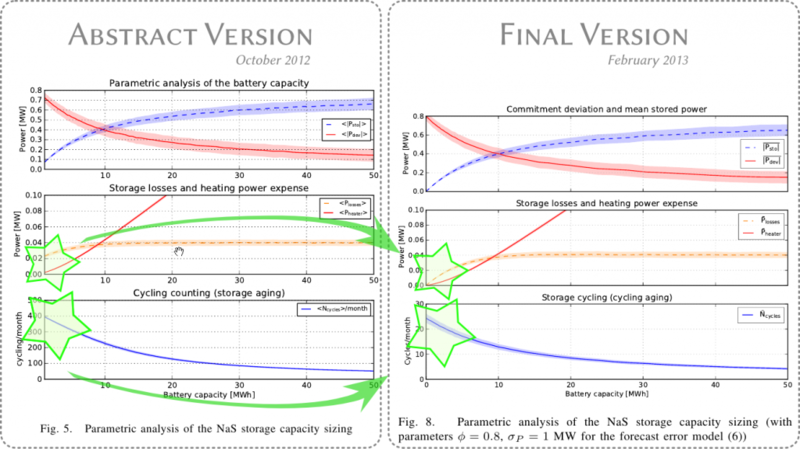 Beyond surface changes in the annotations, I've highlighted two big differences in the results. The most striking change is in the lower pane : the "cycle counting" drops from about 400 down to 25 cycles/month. One order of magnitude less ! Without entering the details, there were several really tiny errors in the implementation of the model. I would not even call these erros "bugs", those were just tiny mistakes. One was somehow like writing Q += i instead of Q += i*dt (omitting the time step when counting electric charges). And when the time step dt is 0.1, that's makes an easy method to miss exactly one order of magnitude ! Spotting those errors in fact takes quite some time and probably one or two weeks were devoted to debugging in November (just after the submission of the abstract). Of course, reviewers have almost no way to spot this error. First the code is not accessible (the battery model is confidential) and second, the value that was wrong (cycle counting) cannot be easily checked with a qualitative reasoning. Since I don't know how to solve the problem from the reviewer point of view, let's get back to my position : the man who writes the wrong code. And let's try to see how to make this code a little better. There is one thing which I feel makes model simulation code different from some other codes: it is the high number of tests required to check that it works well. Even with only 3 state variables and one input variable like the sodium-sulfur battery, there are quite a lot of combinations. and to cover enough situations, I have in fact 6 text files containing each 5 blocks like this one. That's 30 tables to check manually, so that's still doable, but there is no easy way to tell "oh, that -15,107 over there doesn't looks right"... it just take time and a critical eye (the latter is the most difficult to get). If I now want to upgrade the battery simulation code, I want to ensure that the time spent by my thesis advisor and I on the result checking is not lost.I want to enforce that the code always generates the exact same numerical result. "test/NaSStorage single step test Tnnn.txt"
Now, hopefully the simulation code is doing what it should and there won't be a third version of the figure in my article... Hopefully !